It’s winter, that means the conditions outside can be less than ideal for running. Training for a spring race can feel challenging when the weather doesn’t cooperate. Don’t stress, use the winter conditions to sprinkle a little cross-training into your routine. Many runners are resistant to cross-training, but mixing-up training has several benefits. 1. Variety is the Spice of Life! Training all winter for a spring race can feel long and monotonous! Mixing-up training keeps things interesting. If you find yourself struggling to getting out the door for your usual run, try swapping out an easy run for a class at the gym, a spin session, or snowshoeing. Cross-training adds flexibility to your training schedule which may be exactly what you need to stay motivated. Running is repetitive, it uses the same muscles in the same way, step after step, day after day. Many runners get injured because their bodies only have the strength and mobility to move forward. Cross-training often encourages movement in different directions or multiple planes. This winter when you start to notice a small ache or pain, head to the yoga studio, a bar class or the pool. Your body will thank you during your next run. In the winter, the days are short and the nights are long. Running outside by yourself isn’t always safe. If you planned to run around the park with your friend, but she called at the last minute to tell you she has the flu. Use the unexpected opportunity to go to that strength training class you’ve been wanting to try. You’ll stay safe, and may even meet a few new workout buddies. Winter weather is unpredictable, sometimes there’s sunshine and blue skies, other mornings you wake-up and it’s a snow day! Don’t hold yourself hostage to your training plan, enjoy what the season dumps on you. A snow day is the perfect time to break out your cross-country skis and explore the city, head to mountains and hit the slopes, or hop on the fat bike trend and ride the trails. Remember how much you loved snow days as a kid (unless you’re from Montana, we didn’t have snow days)? Capture that joy! Mimic the intensity, time or distance of your scheduled runs. A three mile run is equivalent to a one mile swim. Bike three miles for every mile you were planning to run. 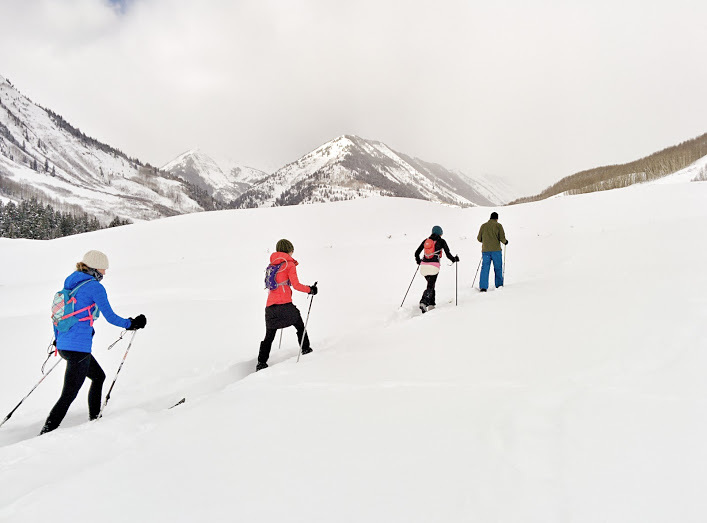 Snowshoeing and cross-country skiing are less intense than running, plan to cover the same distance, but in a longer amount of time. Snow running takes more energy than running on a solid surface, run for time rather than distance. If you’re training for a marathon, there’s one workout you Shouldn’t cross-train, your long run ! It’s okay to move it around if big storm rolls in, but keep in mind the challenges you face in training, make you stronger on race day! Long runs are the backbone of marathon training and can’t be matched.